The whoooooole point of raising chickens is for the awesome chicken eggs. Home grown chicken eggs are more colorful and vibrant, which means they are jammed full of nutrition. Orange yolks! Yeah! We know our birds were treated well because we raised them. We grow our own food and are reducing our dependence on sometimes unreliable outside influences. But there are reasons the chicken industry is the way it is. Laying hens are not machines, and they don’t lay eggs like one. Hens have a laying cycle; if you don’t understand that cycle when you get chickens you may find your expectations are unrealistically high. The hoped for numbers do not always align with the number of eggs in your basket. Even though I love raising chickens for eggs and don’t plan to stop any time soon, I was surprised as my first flock got older how quickly egg production slacked off. What Is The Laying Cycle? The best laying breeds have been selectively bred to produce almost an egg a day, sometimes year round, but originally for the hen, laying eggs was all about raising chicks. Because of this, most chickens lay prolifically in the spring and summer when the days get longer. This is the ideal time to for a hen to raise a brood, and instinctively they lay more. Should I Put a Light In My Coop? Once daylight drops below 12 hours per day, chickens will slow down their egg laying. During fall and winter you can put a light in the coop to encourage egg production in your flock. I haven’t done this because one, it’s too much work. Two, I don’t have electricity in my coop. Three, my younger chickens and ducks lay through the winter decently. And four, I want my birds to have that break to rebuild their nutritional stores. But if a coop light works for you, awesome! Hens start laying when they reach sexual maturity, around 20 weeks of age. They produce most of their eggs from the ages of six months to eighteen months. Then they have their big molt and pause laying for that. A two year old chicken may lay somewhat frequently, but some homesteaders find that it is not enough to justify the feed and coop space. Some people send their older hens to the stew pot. My family tends to get overly sentimental about our livestock, and so we keep ours well past their peak production years. If you buy a few new hens each year your overall flock production will be lower than if you had a flock full of young hens, but you can also count on a few eggs each day from your newer birds while your older birds retire gracefully. This tends to be the route I take, at least until I can convince the family and myself to stop naming the food. (We weren’t going to name any of the ducks. And now I say hello to Jenny Quackers every morning when I refresh her kiddie pool)! 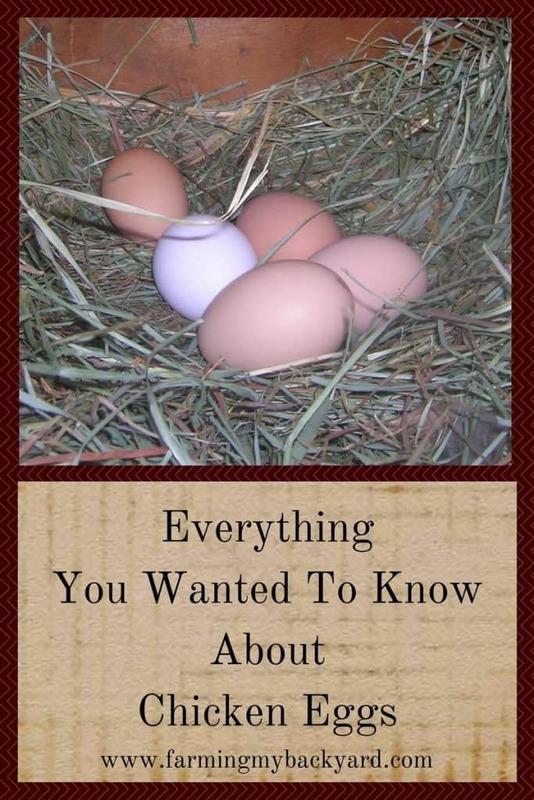 Why Aren’t Your Chickens Laying Eggs? Spring can be so prolific when it comes to eggs. But what if your chickens AREN’T going crazy with the laying? There are actually quite a few reasons why your hens may not be laying as many eggs as you’d like to get. The first and most common reason is not getting enough daily light. If it’s spring right now, that’s probably not an issue. The other common reason is if your hens are molting. This usually happens in the fall. Lately I’ve been having trouble with a skunk getting into my chicken coop before I get out there to close it up for the night. Skunks, raccoons, and snakes all LOVE eggs. They will gladly help themselves to any they can find. Discourage them by covering all the holes in your coop with 1/4 inch wire mesh. Also put the birds away for the night and lock up the coop before it gets too dark. If you find broken eggs in the nest, but you’re absolutely positive predators can’t get in, you may have an egg eating hen. To discourage her, provide extra calcium, add extra nesting material to your nests to prevent accidental breaking, and get out there to collect eggs a couple times a day so she breaks the habit. Spring can really encourage some birds to go broody, which means they want to sit on a nest and hatch them out. Once they start sitting, hens stop laying more eggs. If you have a broody hen, she will sit on the eggs in the nest all day and all night, only getting up for a few minutes to eat a little and drink. Some breeds are more likely to go broody than others. We had a Cochin that was ALWAYS sitting on a nest, but I had her for the awesome fluffiness more than the eggs anyway. You can either move her to a separate area and let her hatch out some fertilized eggs, or you can try to discourage her to get her laying again. Remove all the eggs from under her, collect them periodically during the day, and block off her preferred nesting spot. It can also be helpful to move her out of the nest and feed her treats on the other side of the run to encourage her to stay out. Hens will also sometimes hide their nests. It’s possible they are laying quite happily, you just don’t know where. If hens don’t like their nesting area they will happily go find their own. If they are free ranging it’s very likely there’s a hidden nest. Check under bushes, in hidden pales in the grass, any secluded, private place. It’s your very own nature-hosted Easter egg hunt! To encourage your ladies to use their nest boxes, make sure they are secluded, private, and have plenty of nesting material such as straw. Stress will cause hens to drop egg production. If you recently had a predator attack, give your girls a few days to recover. Even things as seemingly small such as a barking dog, or overly enthusiastic kid chasing them around can be an issue. If you’ve just added new birds to your flock, they’ll all need some time to adjust and get used to each other. If you have a bully chicken it will take even longer for them to settle back in. Make sure everyone has enough space, and there are plenty of feeders and waterers for everybody. Feed can be a big issue. If you feed them too much, they can get egg bound and stop laying. If they aren’t getting enough nutrients, they’ll stop laying. A good layer feed with 20 grams of protein should be perfectly adequate to support their nutritional needs. They only need about 1/2 a cup of feed per day, so too many scraps or scratch grains can lower the amount of protein they are getting. You can also add in supplemental oyster shell as a calcium supplement, especially if you’ve noticed any soft or weak shelled eggs. If your birds are sick, they’ll stop laying. Chickens with parasites, stop laying. If it’s too hot, or too cold, they’ll stop laying. (Sensing a trend yet?) It’s good to keep a close eye on your flock and notice any health issues as they happen and get them resolved as quickly as possible. Keep your coop clean to prevent potential health issues, and check your hens over periodically. If it’s very hot, make sure they have cool treats and mud to walk through. If it’s very cold, a well insulated coop with plenty of straw can really help. Hopefully this list will give you a few ideas as to why your birds aren’t laying, and will help you get back to eating delicious, homegrown chicken eggs! Have You Ever Gotten Strange Chicken Eggs? What if your chickens ARE laying eggs, but they look kind of…weird? Usually chickens lay perfectly normal eggs, but every once in a while you come across on that looks pretty strange. Here are some of the more common strange eggs you may find in the nest box, as well as some possible causes. Blood on the eggshell: This most commonly happens with new layers, but it’s also a sign of too much protein in the diet, or related to obesity. If you notice blood in the droppings however, check for coccidiosis. Odd-shaped Eggs: These can possibly be a sign of a viral disease, but they can also occur from rough handling when the egg first developed, or from a hen jumping down from a decent height, or other physical impact to the egg while it’s developing. Bumps, wrinkles, flat sides are more common in older hens, but they can also be an indicator of too much stress for your flock. Stress will also cause color variations on the shell. Thin Shells: If you are finding thin shelled eggs, make sure your girls are getting enough calcium in their diet. Oyster shell is easy to pick up at the feed store and set out in a dish in the coop. Other possible causes are stress, recent heat, or parasites. This can be a sign of infectious bronchitis, so if you also notice rough shells, decreased laying and coughing, sneezing, or rattled breathing especially at night, make sure to rule it out. Shell-less Eggs: Sometimes eggs get laid without a shell at all. They do have a thin membrane keeping it all together, and if you’ve ever done the science experiment where you soak an egg in vinegar, it’s kind of like that. Shell-less eggs are caused by the same issues as thin shells, but it can also spontaneously happen sometimes in older hens. Bumps on Shell: I was weirded out the other day when I found a duck egg covered in little bumps. Thankfully it’s just caused by too much calcium in the diet. Turned out I had a hen that was chasing the ducks away from the feeder, and they were eating more oyster shell because it was in a different spot. A little rearranging sold that problem rather quickly. Yolk-less and Very Small Eggs: These are most common with newly laying pullets, but they sometimes occur with older hens right before they start laying or after a break. Blood Spots In Yolk: Blood spots can look disturbing, but they are just an occasional glitch. They can also be genetic. I have one hen in particular that occasionally lays eggs with blood spots. I usually just fish it out with a spoon and eat the rest of the egg, but if it really bothers you, you can always scramble it to feed to the hens. Egg inside an Egg or Double Yolk: Sometimes you may find an egg with a shell insides another shell. Or you may find two yolks inside one shell. This happens when a second egg forms before the first finishes. Doubles yolks happen when two yolks are released at the same time and a shell forms around both of them. Double yolks aren’t a problem unless the shell is too big for the hen to lay. Have you ever come across any of these strange eggs before? Luckily, many are easy to fix and keeping your flock healthy, happy, and well fed can prevent many of them from occurring. OMG! That was really helpful and helps me understand my chicken better. We should probably go get some more chickens, so she’s not so lonely. But thanks for the info! Yes, she’ll be much happier with a friend!